Britain’s aviation industry in 1934 still had the same core concepts as it did during the First World War. Its main lines of defence were still open cockpit Bi-planes, not yet having made the switch to sleek monoplanes that were starting to be developed elsewhere. The Gloster aircraft company made a slight change to this policy, on the 12th September 1934, when their Gladiator first flew. It was still a biplane, admittedly, but it had a closed in canopy, which was a first for an RAF Fighter, as well as other “modern” additions such as landing flaps. This was an aircraft that flew for the first time on the same day as the Hawker Hind, which was essentially the same design as that of the Hart, which first flew in 1928, so it was quite the leap at the time! By comparison the Gladiator was cutting edge, with a smooth Bristol Mercury radial engine, providing 840 horsepower, combined with ailerons on all four wings for extra maneuverability, this really seemed a machine ready for fighting modern wars. The Gladiator had a top speed of 253mph and was well armed with 4 machine Guns, accounts from pilots at the time have commented on how much power the Gladiator seemed to have compared to previous aircraft they had flown. However by the time the type was being introduced it was already obsolete. Coming into service in February 1937, the Gladiator was now behind both the Spitfire and Hurricane, which had flown in March ’36 and November ’35 respectively, and both were in service within the following 2 years. With these new monoplane fighters now coming into production the Gladiator was swiftly moved away from front line service. Though some aircraft remained on squadrons during the “phoney” war and early on in the Battle Of Britain while the backlog in production of the newer fighters was cleared. The types most famous combat theatre was Malta. It was here that the Hal Far Fighter Flight provided air defence for the island in 1940 largely flying against the Italian Bi-plane fighter, the Fiat CR42. The Fiat was a similar design to that of the Gladiator, a Bi-Plane with an 840hp radial engine, it had an open cockpit and didn’t fly until 1938, it became one of the Gladiators main adversaries. A Fiat CR.42 at RAF Museum Hendon. A widely believed story is that only 3 aircraft, named Faith, Hope and Charity were the entire defence for Malta. In reality the names were adopted after the Battle and there were more than 3 Gladiators operating, with a number of spare aircraft, though not always at the same time. Campaigns in North and East Africa saw the Gladiator facing up against the Fiat CR42s once again. Where it was found that the Gladiator just had the edge over the Italian machines. The last front line action that the Gladiator saw during the war came with the Finnish air force, in 1943 against the soviets. 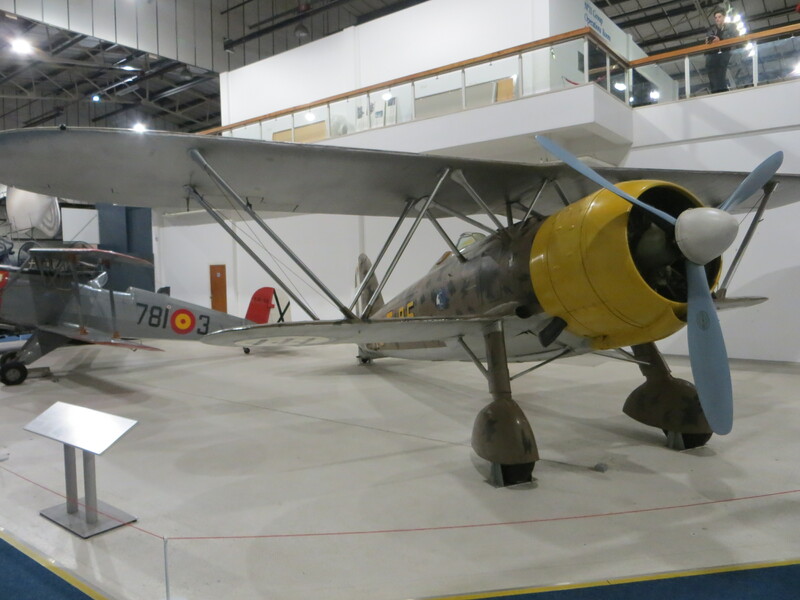 In the modern era the Gladiator hasn’t been forgotten, with two survivors still in airworthy condition and a number of static airframes and restoration projects. Almost without interruptions the Shuttleworth Collection’s Gladiator Mk.1: L8032/G-AMRK, has been a presence on the air show circuit, always putting on an impressive performance, low and fast and close to the crowd. My early memories of the aircraft displaying are from when it wore Norwegian Air Force colours, as it did for much of the 90s and early 2000s. In 2007 the collection repainted in the aircraft into pre-war RAF silver colours, which in my opinion suit the aircraft better. 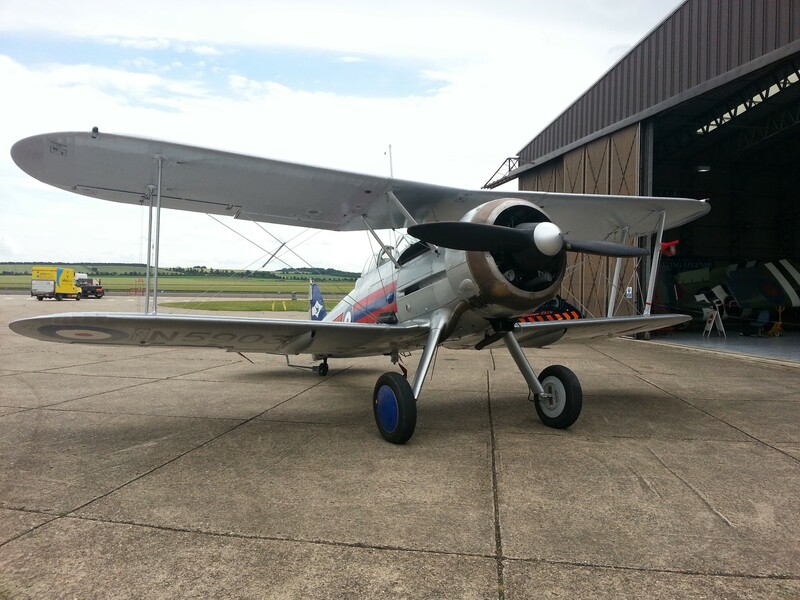 The Shuttleworth Gladiator rolling out at Old Warden. I can vaguely recall watching the Shuttleworth machine performing high level loops some years ago, but with a change in the Shuttleworth flying policy, the gladiator in recent years has been restricted to no aerobatic flying, much like the majority of the Shuttleworth fleet. While aerobatics are by no means necessary to an engaging flying display I had always wondered what the Gladiator could really do. It was the last of the Bi-Planes after all, with a lot of power. I wondered how much was being held back with these displays. 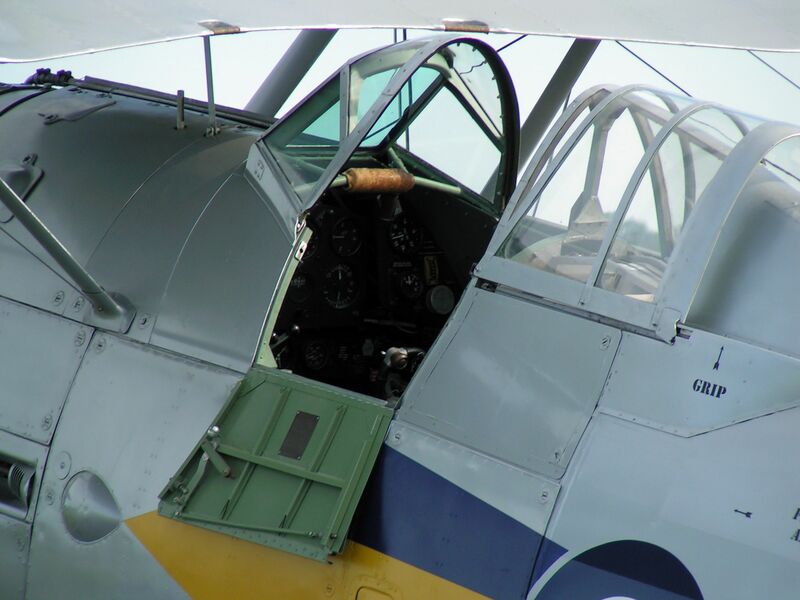 Having read articles over the years and watched interviews from wartime pilots on the type, it became apparent that it must have been quite a potent machine. Enter the Fighter Collection. For years there had been a metal framework sitting to one side of the collection’s Duxford hangar, without much noticeable progress being made, but soon enough this framework suddenly turned into fully finished Gloster Gladiator II: N5903/G-GLAD. 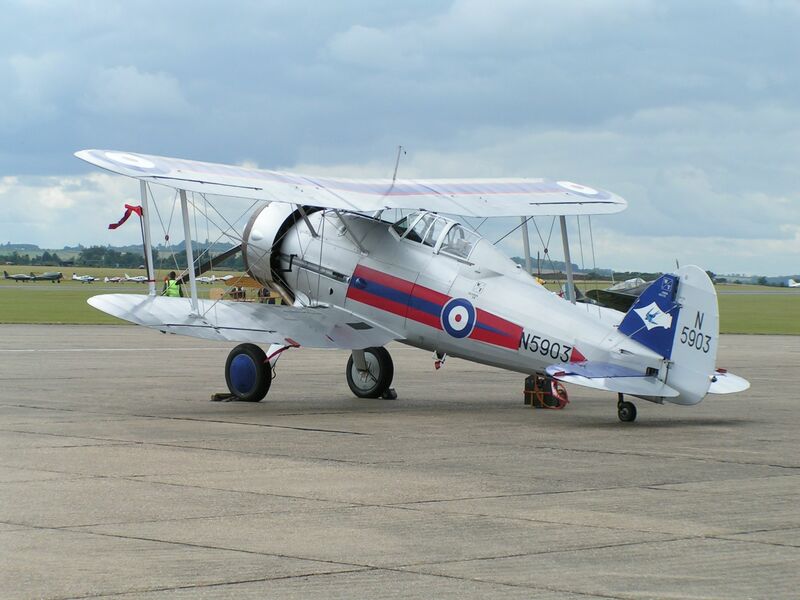 In pre-war silver with Blue and Red highlights, the second airworthy Gladiator was rolled out in 2008. Flying shortly before that years Flying Legends show the aircraft was unable to perform, only carrying out a short test flight on the morning of the show. This meant that the much-awaited Gladiator two-ship display would have to wait. As it turned out, it would have to wait a lot longer that we all thought. Due to problems with the CAA the entire Fighter Collection’s British registered fleet was grounded in 2009, meaning that each aircraft had to undergo a thorough inspection before flying again. With a number of crowd favourites and rare aircraft in the Collection, the Gladiator was quite far down the list. It wasn’t until last year, 2013 when the Gladiator would take to the skies again. 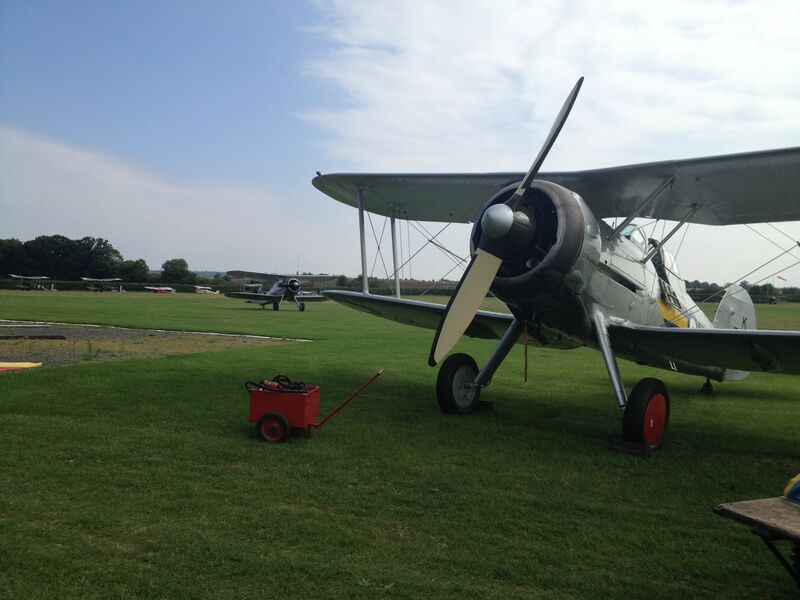 2013’s Flying Legends show was the aircraft’s Debut display, and what a show for Gladiator fans! The two Gladiators formed up for a number of passes together before splitting into solo displays, the Shuttleworth aircraft stayed low and fast, flown by Keith Dennison, while up above the Fighter Collection’s chief pilot, Pete Kynsey put TFC’s example through its paces. A higher-level display of loops, rolls and half Cubans followed, showing the aircrafts fighter pedigree in a way that surely hadn’t been seen in decades. While this display was impressive and a joy to watch, I found myself wishing for a low level aerobatic display, as was the norm for the Fighter Collection. I decided that maybe the Gladiator wasn’t up to such a performance without putting unnecessary stress on the airframe and engine. 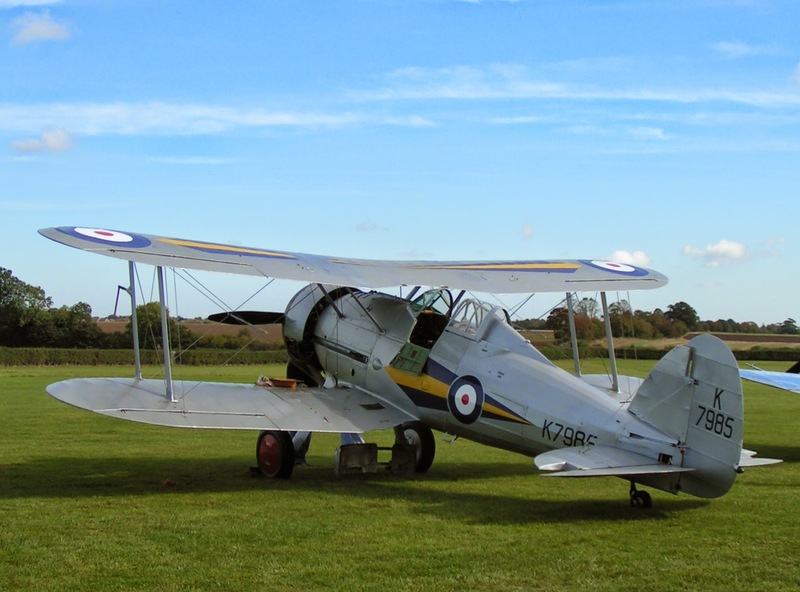 The Gladiator Pair at Old Warden in September. But I was proved wrong at the end of the show. Performing the joker routine for the first time, following his father’s retirement, was Nick Grey. Rather than using a big, fast and noisy late war fighter, Nick had chosen the little Gladiator to keep the crowd entertained with. What followed was truly mesmerizing and, in my opinion, one of the greatest solo displays I’ve ever seen. Diving in fast and close to the crowd line, bracing wires singing. Nick went on to perform a countless array of loops, rolls and high wingovers, seemingly hanging at the top of each maneuver making sure every bit of energy was converted into height, much to the delight and disbelief of the crowd. Still the smooth Bristol Mercury sounded like it was running at tick over, a remarkable low level masterclass. It seemed that in the Gladiator Nick had found “his” aeroplane. I’m aware I’m rambling a bit here, but finally seeing what a Gladiator could do was a big moment for me. I don’t want to spark a debate over the better way to display historic aircraft, as there are arguments for both sides and a time and a place for each. 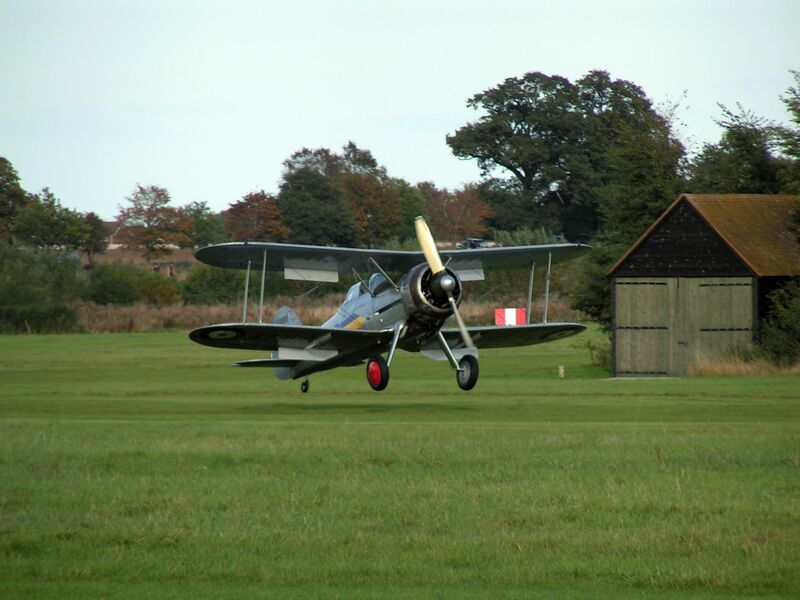 At Shuttleworth, for example the best way to show a Gladiator, or any aircraft is low, fast, flat and close to the crowd, whereas in a wider arena such as Duxford, free-flowing aerobatics can make use of the larger airfield. It is a luxury that seemed impossible 10 or so years ago of course, to even be discussing the merits of 2 different operators and their methods of displaying a Gloster Gladiator. An even stranger thought is that within the next few years we could be watching two Gladiators in a mock dogfight with a Fiat CR.42. The Fighter Collection currently has an example of the Italian fighter under restoration, one of many exciting prospects for the UK airshow circuit in the next few years. 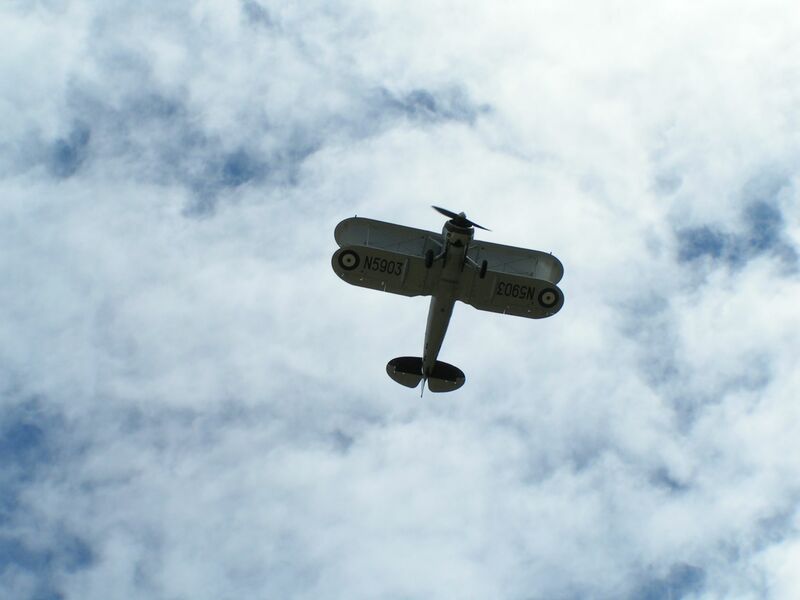 So, while the Gladiator arrived a little too late to ever really assert its dominance as the pinnacle of Bi-plane fighters, it still provided a key role in the history of the war. It was a unique design and today is still performing and telling its story to crowds at airshows around the country. If you enjoyed reading this post or have any suggestions for any future Warbird Stories, then why not follow Warbird Tails on Twitter: http://www.twitter.com/WarbirdTails or Facebook: http://www.Facebook.com/WarbirdTails. I look forward to seeing you there.